Hi everyone! Today I have a sad announcement to make regarding the PE Forums. After almost 6 years of having the forums (the launch post here in October 2010), it is with a heavy heart that I announce the closure of the PE Forums. For most of you, this update won’t be relevant — if so, just skip this post. Otherwise, continue reading. I’ve already announced this in the forum over a month ago to give everyone enough prep time, so for those of you who have been visiting the forum, this shouldn’t come as a surprise. If you are a forum member but haven’t visited at all in the past months (or years for that matter), you can read this update first, then hop over to bid your final farewell before the forum closes on August 31, 2016. Maybe we can have a walk down memory lane first. 🙂 The PE Forums was launched in Oct 2010. Prior to starting PE, I have managed web forums before and felt that having one would be a great addition to the site. Forums are a great way to build a community, and I wanted to provide a platform where PE readers could connect with each other. Besides PE Forums, there were many things that I launched between 2010 and 2012, like the Ask Celes column, PE challenges, PE courses, PE manifestos, PE quotes, and so on. Building a forum, much less a successful one, isn’t easy. You need to invest a lot of time to foster the community. You need to be heavily involved in the discussions, at least at first, to encourage everyone to speak up, get comfortable, and set the tone for future discussions. You also need to create a fun platform where everyone wants to join in and hang out. There is, of course, the moderation work involved too. So I invested a lot of time in building up the forum in the beginning. From customizing forum templates, to deciding on the sub-forum topics, to researching/installing special features like a “profile wall,” a “buddy/friend” system, and so on, to troubleshooting issues, there was much work that went on behind the scenes. The forum user base grew steadily. I tried different ways to increase engagement, including integrating PE challenges with the forum. This worked well, though it was also very tedious as I had to do a lot of back-end work to ensure that the usage experience was seamless. Since forums are more of an “advanced” web user tool, continually trying to get non-users to use the platform meant having to deal with basic user problems too, like basic technical questions, teaching users to post threads in the right places, etc. If I remember correctly, the forum usage was at its peak during the Healthy Living Challenge in 2011. During that time, there were over a hundred users actively posting per day! It was extremely exhilarating to see everyone’s journals and their healthy living journals; I remember thinking of plans to bring the forum to the next level if this growth had continued. But over the years, the forum activity began to dwindle. While integrating challenges with the forum helped boost user numbers at first, most users would stop using it after the challenge was over — sometimes mid-way through. The reality is that most people were only there to participate in a challenge, not to engage in a forum, so it made sense that most would leave after that. Such integration also hurt the participation of the challenges, since it’s not as easy for the average reader to follow forum activity vs. blog updates. Yet beyond this, the bigger trend happening across the web was the rise of micro-blogging platforms. While independent forums were fairly popular in the late 1990s and 2000s, the emergence of social media and micro-blogging tools like Facebook, Facebook Groups, Twitter, and Instagram meant that people could now easily get their voices heard and connect with others on their own. There is now a lesser need for people to hang out at a specific web forum when they can just connect with others using their own social media profile. Interaction began to happen primarily on these social media platforms rather than on blog-hosted forums. Around the same time, the web exploded in users and along with that, content channels and web businesses. Suddenly, there is so much to do online, so much content, and so many sites vying for your attention. The internet switched from a place where people quietly hung out and immersed in every site they visited (1990s; early to mid 2000s), to a bustling marketplace where you are now bombarded with messages left, right, and center. The average attention span online became much shorter (it’s now 8 seconds; congratulations to the new era of humanity -_-) and people began to use blogs more to get the information they need vs. to engage. These 2 factors combined meant that people started to ween off blog-hosted forums and use social media tools for engagement, if they even used the former to begin with. Around the net, blogs became information dissemination tools and even sales channels, rather immersive verticals, which further drove such behavior. Many blog-hosted forums began to shut down: some due to inactivity, others due to the amount of work needed to keep things going. At the same time, a separate issue emerged. Spam. The PE Forums received a massive spam attack a month ago. Hundreds of spammy posts were unloaded onto the forum over a span of 2 days, through a whole bunch of different user accounts, registered using different IPs (probably proxies), all authenticated through spammy hacks. Sadly, this hasn’t been the only serious spam problem I’ve encountered since starting PE. The truth is that spammers, or rather spam bots, have been trying to attack PE every single day for years — not just the forum, but everywhere else on the website. As PE is a high traffic website, it naturally draws the attention of many spammers who hope to leverage on PE’s traffic for their spam. Our newsletter forms, blog comment forms (which I closed last year), my social media pages, and our forum are just some of their targets. With regards to the forum, in recent years, we have been getting trickles of spammy posts on a weekly basis and large spam attacks every few months. Each time, my assistant Lina would help me clean up the spam posts while I would review and tighten our anti-spam measures. Yet, blocking them has always been a cat-and-mouse game, where I’d research and implement some measure to block out the spammers, after which they’d try to attack in a different way, after which I’d have to research and implement another method to block them out, and so on. It never ends, because spammers will always find ways to bypass your anti-spam measures. It’s basically human vs. human. The massive spam attack a month ago got me to seriously think about the future of the forum. Not only did it create a lot of cleanup work, it also created pesky issues that affected other aspects of the business. One, Google’s search engine banned our site thinking that we were a spam site (the spam posts were, after all, posted on PE). This ban was lifted after I wrote in to them, but not before waiting for several weeks for their reply, and not before seeing a traffic dip (which is still in effect and will recover in time, but this is creating real impact on the PE business, our revenue, and so on). Two, after years of dealing with this spam problem, it has become very draining to deal with it anymore. The spam issue hasn’t remained the same or reduced through the years despite the increased security measures; it has increased because the forum is now a bigger target for spam than ever, and more spammers are online now than before. Managing the forum has begun to feel like I’m dealing with a ticking time bomb that may explode in my face at any moment, which it did a month ago. All these time and energy could have been better spent into higher value Q2 stuff for my business, but they weren’t. And all this said, there’s also the usual work that goes into managing a forum. This work includes moderation (which Lina and long-time PE reader Mel help me with), technical maintenance (to ensure the code is working fine, that there isn’t any broken stuff), customization, answering user questions, and more. The PE Forums is a free-to-use forum so it doesn’t bring in any revenue, just costs. While there are ads in the forums, they don’t bring in money as forum users usually don’t click ads. This isn’t an issue though as I had never intended the forum to be a revenue generator. The issues that I mentioned above, however, are real ones. In light of these factors, I realized that it’s time for the forum to go. The reality is that it has been inactive for a long while. For the past 2 years, we have gotten at most 3–5 active users per month, and about 1–2 active users per month in recent months. This is about 0.01% of the daily user traffic at PE. Yet, whether it was for 1 user or 10 users, I strove to keep things going for as long as I could. Even if it was for one user, I wanted to provide them that safe place to post about their goals and journal their life’s progress. But I think it has reached the point where the costs of running a forum are too overwhelming for me to ignore, and the cons now significantly far outweigh the merits. Keeping the forum afloat has caused me to neglect other activities where I can create far more value to you guys, such as working on a new course for example (the last time I held a live course was a year ago). I’d like to focus on the basics of basics from this year onward, which would be to create value for you guys in the most scalable way, through my articles, podcasts, and courses. It’s sad for me as I’ve done so much to build up the forum and keep it going, as have many of the members who have selflessly contributed their wisdom and thoughts through their postings. 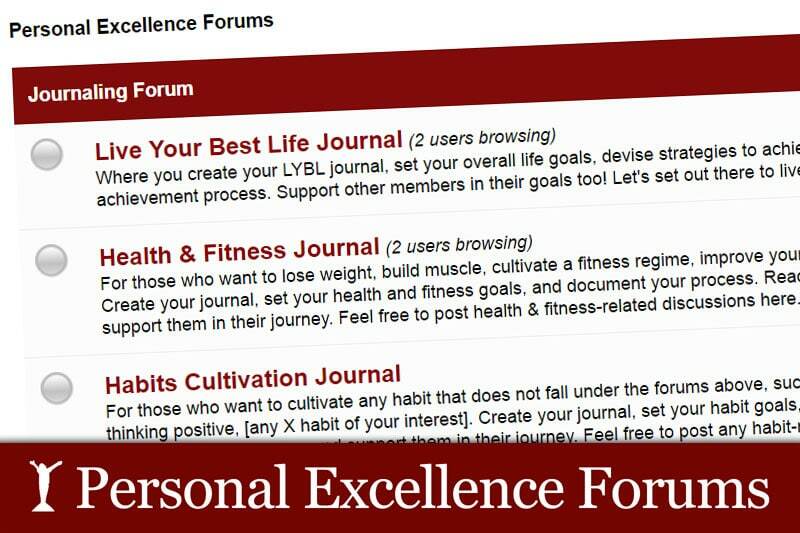 I’d like to apologize if the closure of the forum will be any inconvenience to your own self-journaling journey, and hope that you will be able to find a replacement tool, such as a private online blog or a journaling software, to continue tracking your own progress. I hope the forum has provided some value to you guys in the 6 years it’s been online — I know it has for some of you, based on your feedback — and hope that you have gained something that you can now take away with you, moving forward. The forum will close on 31 August, 3016. I hope this will give everyone enough time to say their farewells, save their own journal threads if they like (I’ll be taking the whole forum offline once it’s closed), and exchange contacts with one another. All information will be lost — member info, threads, etc. — so please save and reach out to your forum buddies before then.